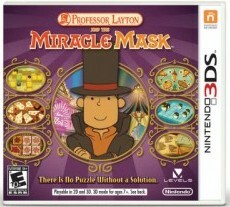 Nintendo has posted box art and a new trailer for the upcoming adventure game, Professor Layton and the Miracle Mask. The Level 5 developed Professor Layton series has grown into a very successful franchise that shows no signs of slowing down. Downloadable content in the form of new puzzles has been a hallmark of the series and Level 5 is pulling out all the stops with their latest game. Starting on launch day, you will be able to download one additional puzzle per day for 365 days. That means a year's worth of additional content at no additional charge, Nintendo sure knows how to take care of their fans and not milk them when it comes to DLC. The game is set to hit stores October 28.